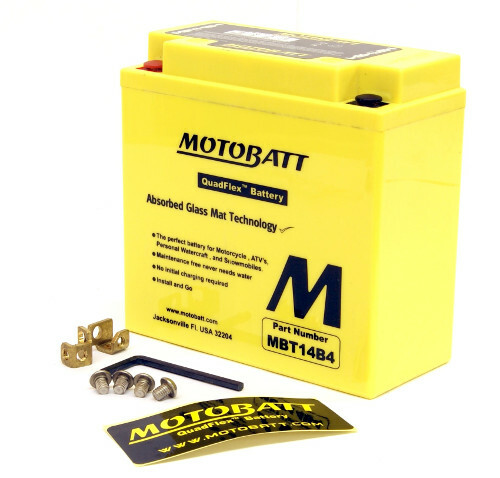 Treat your motorcycle to a MotoBatt battery — the official batteries for AMA (American Motorcyclists Association) Pro Racing. A power balanced design combats the threats of high vibration, high starting loads, and additional high-powered accessory loads by combining strong cranking power with the highest Amp Hour possible. With an increase in lead plate placement per unit, MotoBatt batteries have a CCA (Cold Cranking Amp) that exceeds that of the original equipment, providing excellent starting power. The high Amp Hour in each MotoBatt allows the batteries to discharge more deeply, and recover repeatedly under vehicle alternator charge or through maintenance charging. A unique Quad Flex terminal configuration (four terminals, 2+ and 2-) allows for a shorter current path to the battery cables, for quicker power delivery and improved starting ability. AGM (Absorbent Glass Mat) technology is used in the batteries, which absorbs all liquid electrolyte while keeping the plates separated and in a cushioned environment. This stops them from vibrating and provides increased reliability and longevity (AGM batteries have an inherently low rate of self-discharge) of the battery. All MotoBatt batteries are factory activated — pre-conditioned and fully charged — for optimum performance. They are ready to install straight out the box. Maintenance free, there's no messing with electrolyte or harsh acids. Use our model search below to find a MotoBatt for your machine.